Mahesh says that It makes him happy to see people enjoying his art. He mostly uses oil colours medium on canvas. He usually paints on nature & Worship theme. He used nature related elements. His paintings gives him so much relief and happiness. 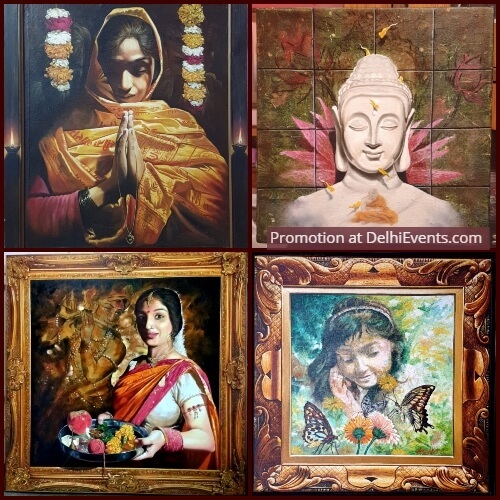 Some titles his paintings are Journey of Buddha, Messenger of Love, Prayer of Lord Krishna, Ganesh Aradhana, Desire to Fly, Ganesh With Lotus, Buddha with Lotus. He gives Three dimensional effects in his paintings along with painted frames which gives the witness of his creativity .His all paintings are really amazing . While making painting he reaches to a new world of imagination. Mahesh was passionate about art since his school days. He had won many Awards and certificates in school. His teachers always appreciated his god gifted talent;. 41 years old Mahesh is a Senior Self taught artist. He had participated in many group shows like Global Art Fair, Mumbai, Visual, Art Gallery,New Delhi, Lalit Kala Akademi, Epicenter, Gurgaon,Impart Art Gallery, Ashoka Hotel, Artizen Art Gallery including Art Camps & Workshops. He got second position out of 500 participants in "On the spot graffiti contest" in 2013 organised by Delhi Wall Book at University of Delhi Walls. Mahesh was also Awarded with “Rotary Kala Vibhushan Samman”by Rotary Club of Delhi Uptown for his contribution in Art. Mahesh is great graffiti artist too. Many places of India showcase his graffiti art. Mahesh’s every painting is outcome of his innervoice. Each of his painting is based on different moods and emotions. He loves to express the beauty of worship and nature in his painting. He does painting all by his heart. He enjoyes creating inspirational and beautiful paintings . Each of his artwork reflects his feeling, sensitivity, passion towards his interest . He say’s that He couldn't have touched the apex without the blessings of his parents.